Sure you've always wanted to view the movies or series coming to your computer in a much more convenient than moving the laptop from the bed to the living room or vice versa. Sure you have a very appropriate TV to enjoy the best movies in high definition and you do not know exactly how. Even at best, you could enjoy them on your TV but your next laptop with a cable to the screen. As with the input that we bring today, and it will go down because we will explain an alternative that many users contemplated as the best in order to create a real home media center, building the features and compatibility of our Apple devices. This possibility is no more nor less than handle all our multimedia content through iTunes, then through the Apple TV device, to view it wherever we want (TV, iPhone, iPad or iPod Touch). Yes, I know, we have not discovered the panacea of ​​Media Centers, but sure many of you (including myself included) have been long with third-party programs (like Plex for example), which have a very good interface but you have always had to put the computer next to the TV with the cable blissful prolong our laptop screen to the TV. In this post, we will explain the installation process from the Apple TV, to display our multimedia content in it, through intermediate steps such conversion of video files to format. M4v (the supported by iTunes), establish correct labeling of file metadata (file information both to cover video, synopsis, author, genre, etc) and good management of our entire media library in iTunes. To begin, I must say that if one of you already has an extensive library on your external hard drive or computer, it is more cumbersome to begin. I say this because the first thing to do is to convert video files (. Avi,. Mkv, etc) format. M4v, valid for reading later viewing on iTunes and in all our devices via Apple TV. I say this for example putting my case: almost 900 GB between series and movies cost me almost 10 days to pass the content to that format. This format conversion process. M4v is extremely simple and automatic. From EsferaiPhone, with our experience in converting any video file, we recommend RoadMovie program for this purpose. It is present in the Mac App Store at a price of € 26.99. While the price is considerable, is a true conversion machine, not only for speed, but for the conversion options you have. With all this, simply add the desired video files for conversion, set Apple TV format (720 or 1080) and give the send button. By order of entry, the program will convert archives and keeping them in your wallet so that the user can import it into iTunes. Thus, and with more or less work (1.5GB file makes my case in about 40 minutes, on my Mac Book Pro 13'' 2009), we will have our media library in iTunes. You can also use other free programs like HandBrake , that you also will convert to different formats. In case of Windows users, you can try Video Converter Ultimate for the conversion of appropriate formats. The next step is to establish the appropriate information for each of the video files (metadata) that we have imported into iTunes. For me, this is the most important step, it is essential to be perfectly sorted and classified the iTunes library, and to manage, search and filter at one time desired video files. 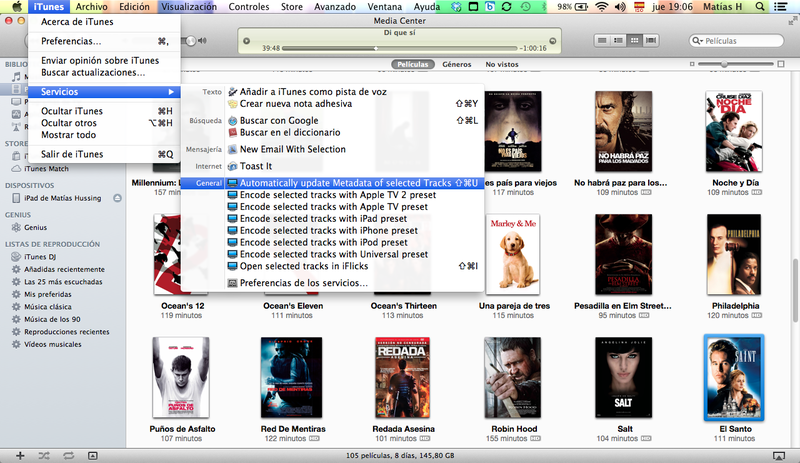 To this end, we recommend iFlicks program, which can be found in the Mac App Store at a price of 17.99 €. This program is very good, both in video format conversion. M4v, particularly as the search for the metadata to the files from our library. This action is very simple, quick and efficient, saving many hours of manual tagging. Just enough to have iFlicks open in the background, select the desired files in iTunes, and go to the following path: iTunes - Services - Automatically Update Metadata of Selected Tracks, and in seconds all our library will be fully updated with information each file (movie or series cover, genre, author, director, actors, synopsis, etc). While it does not hurt a manual check, but the result is fantastic. You can also try Subler , which is free, and allows you to edit the metadata file. With these steps, you will have the converted files and correctly labeled and sorted. Remains only enjoy them. 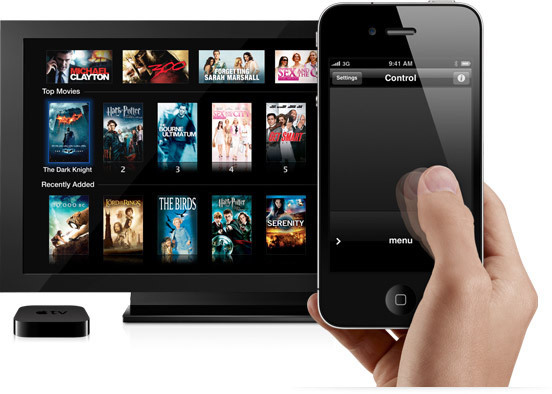 Obviously for the option we suggest, it is necessary that the user has in his possession an Apple TV. This device is installed in the computer, is linked to our network via WIFI and play streaming content from our library (among other options). We select between series and movies, and filter by genre our multimedia library and thus able to enjoy it on your television, without moving an inch our host. In turn, the Home Sharing option (which will select both the iTunes and in each of our devices wherever we want to display the contents) all the media you can play on each of our devices that have Apple (iPhone , iPad and iPad Touch), completely independently for each of them. This way of managing and display multimedia content you may have, is just one of the many options available. Obviously, at first, may seem too heavy to have to convert all files (and more if you have a library as extensive as is my case), but is not required to turn everything. It may well, go slowly becoming and enjoy together. Hopefully I have served this alternative to be considered as a home to enjoy a good Media Center wirelessly and movement of equipment and, above all, the chance to enjoy playback on multiple devices, may be of the same or different media file. Here you have the links to the programs we have discussed. Do us get your opinions, so that together, we may be discovering more ways to experience and enjoy our home and Apple iOS devices. We wait! Awesome. you guy did a good job. i have a question, i have some mts files in my Canon camera, how do i import them into iMovie for editing?